Cochabamba – Bolivian entrepreneur Marco Montenegro, one of the organizers of the Fercos Brothers Show tour, has announced that the Las Vegas based magic show will be prevented from using any of its wild animals during performances in Bolivia. This is due to municipal bans on animal circuses in various cities across Bolivia. The decision not to allow the wild animal acts has been hailed a milestone by Animal Defenders International (ADI) who, with many Bolivian animal protection groups have worked together to enforce the municipal ordinance bans on the use of animals in circuses in the cities of Cochabamba, El Alto, La Paz and Santa Cruz. The bans were the result of ADI’s campaign Stop Circus Suffering in Bolivia, Colombia, Ecuador and Peru and have been heralded as major steps forward in animal protection in the region. Shows by the Fercos Brothers, from Las Vegas, whose act includes lions, panthers and white and orange Bengal tigers were met by protests in Peru, where legislation to ban the use of animals in circuses is currently before Congress. The decision by the Fercos Brothers to bring their wild animals to Bolivia was the first major test of the Prohibitions there. ADI says the Bolivian authorities and the municipalities of Cochabamba, El Alto, La Paz and Santa Cruz are to be congratulated for their humane stance. ADI has also written to Marco Montenegro commending him for ensuring that Bolivian law has been respected. These moves in Bolivia set an important precedent for South America, confirming that measures to prevent animal suffering at national and local government level can be effectively enforced. It has also shown that entertainment in Latin America will not be hindered by prohibiting the use of animals. The show can go on without animals. Juan Pablo Olmos, ADI South America Campaigner commented: "This is a great victory for animal protection, law enforcement, compassion and commonsense. With legislation to ban animal circuses currently being reviewed by the Peruvian Congress, the importance of this action in Bolivia cannot be underestimated. The simple fact is that animals suffer in traveling shows. 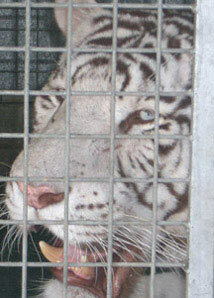 They are forced to live in very restricted, temporary facilities and then made to perform unnatural acts. Both public and politicians are increasingly realizing that circuses, including stage shows like the Fercos Brothers, are no place for animals." Tim Phillips, ADI Global Campaigns Director: "The days are now numbered for shows with performing animals. Already, many of the old animal acts have been replaced in Las Vegas with human only shows, but the Fercos Brothers are finding that they cannot simply export these shows elsewhere. Measures to ban the use of animals in traveling circuses under national legislation are currently under consideration in Peru, Bolivia, the UK, and Greece, with bans already secured in countries like Austria, Costa Rica and Singapore, and through hundreds, if not thousands, of municipality bans around the world. And, the public, whether it is South America, the USA or Europe are increasingly clear they do not want to see animal suffering in the name of entertainment. Bolivia has shown this week that strong animal protection measures can be effectively enforced ¬– good news for entertainment and animal protection."